Engagement season is here! This means newly engaged couples everywhere are starting to plan their wedding and looking for wedding professionals who can help them pull it all together. The first stop: choosing the perfect wedding venue! There are so many options out there, especially here in beautiful historic St. Augustine. So how do you decide which venue is right for you? Don’t worry! We have compiled a list of the best wedding venue questions to ask so that you can find the location that best suits your needs and budget? If you are looking for a wedding venue in St. Augustine, we invite you to contact us at the Lightner Museum. We would love to answer these questions for you over the phone, or set up a venue tour to answer your questions in person. We offer private tours seven days a week–even on event days! 1. How many guests can the venue accommodate for my wedding? 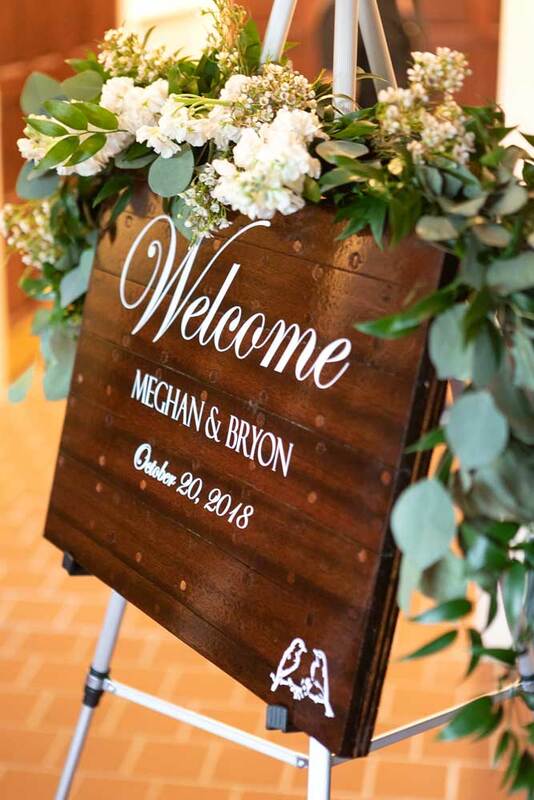 Before the wedding planning process can really begin, it is important to discuss your guest list with your fiancé, family, and anyone else who will be playing a crucial role in planning your big day. The guest count doesn’t need to be exact, but you do need to know an approximate number before reaching out to wedding venues. 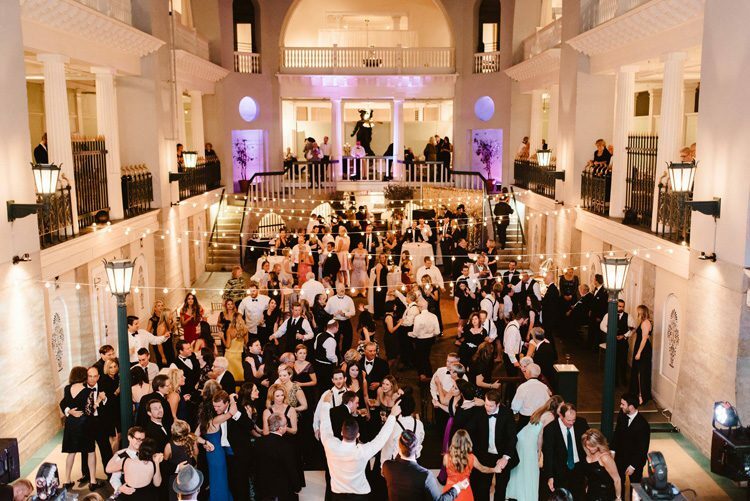 Here at the Lightner Museum, we have hosted weddings as small as 50 guests, but our average wedding is typically closer to 150 guests to take advantage of the Historic Pool’s grand space. Many venues are also flexible depending on your desired layout. The Lighter Museum has accommodated weddings of up to 300 guests! 2. What dates are available? One of the most important parts of the early wedding planning process is picking the wedding date. Some couples prefer to choose a date that is already meaningful: an anniversary, a holiday, or a date that just has a nice “ring” to it (get it? 😉). We recommend having several date options, or a range of dates available when you start reaching out to wedding venues. You may find that pricing varies widely depending on the day of the week or the time of the year that you choose. Some venues also book up very quickly, so having some flexibility will open you up to having more venues to choose from. 3. Does the venue require that you use an in-house caterer? Having an understanding of the relationship that your wedding venue has to food service is essential before making your final decision. Some venues, such as restaurants and hotels, require that you use their services for catering. This can have benefits and drawbacks. If you are looking for a one-stop-shop, having an in-house caterer can make the planning process quick and easy. However, when it comes to budgeting, menu pricing is often higher for in-house catering than going through an outside catering company. 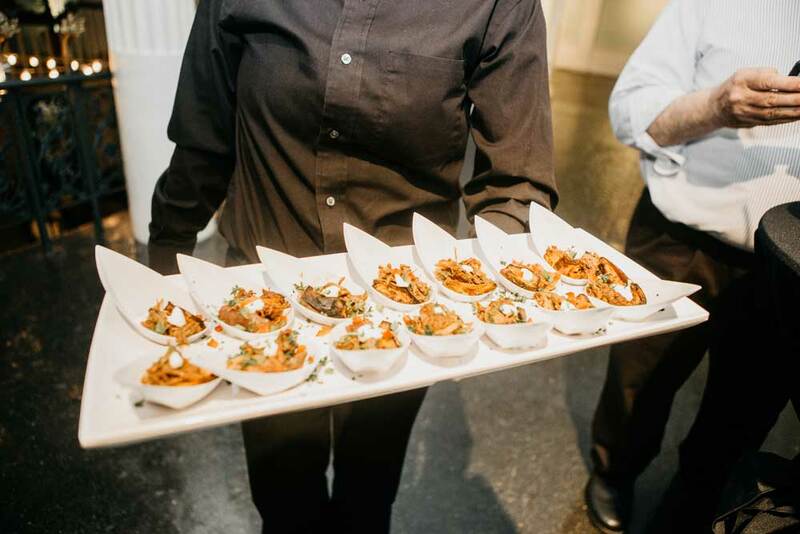 Venues with an in-house caterer often charge a lower initial venue rental fee, but set a food and beverage minimum that you must reach with your menu selections. You may also have more limited menu options with an in-house caterer. Companies that focus strictly on catering typically have more variety and love to create a unique dining experience for guests. 4. What vendors can I choose from? 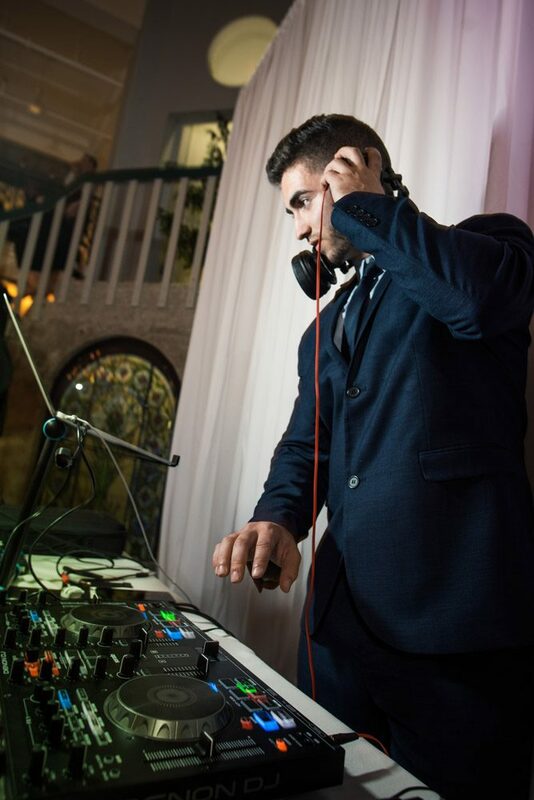 Venues often have relationships with other local wedding professionals, such as wedding coordinators, photographers, caterers, and DJs. These vendors may be recommendations or requirements. Venues know that when this team of vendors works together, everything on your wedding day will go off without a hitch. If there is a particular vendor that you have your heart set on—like the wedding coordinator that did an amazing job planning your big sister’s wedding—make sure to ask your venue about their requirements early on. Some venues will make exceptions for vendors that meet a certain set of requirements. 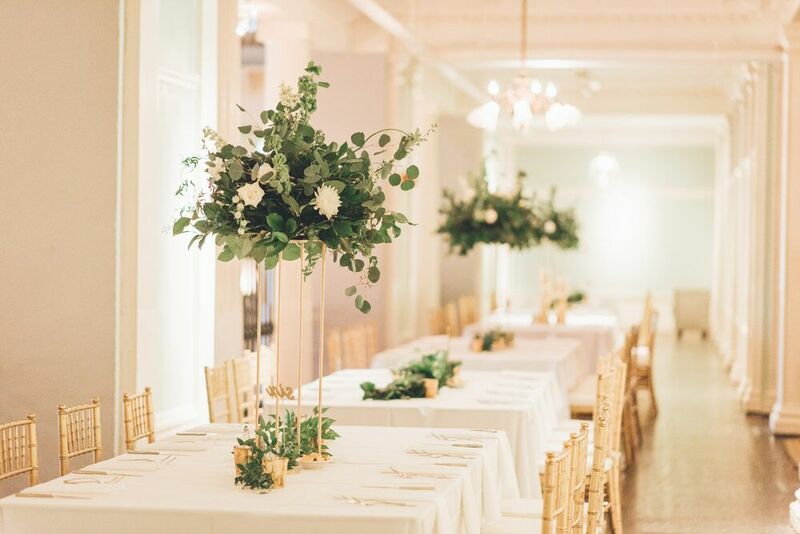 At the Lightner Museum, we have a fabulous list of top-notch Jacksonville, Orlando, and St. Augustine-based wedding vendors to help you create your perfect wedding vendor team. We do require that you choose a wedding coordinator and caterer from this list. 5. What is included with my venue rental? Included amenities vary widely from one venue to another. Some venues are simply a blank space where you can create your own “wedding package” from the ground up. Other venues include all of your tables, chairs, and much more. It’s important to consider the included amenities when comparing the pricing for each venue; costs for rental items, delivery, and labor fees can add greatly to your bottom line. Not to mention, making decisions about the quantity an type of items you need can add a lot of time and stress to the wedding planning process. Here at the Lightner Museum, we have some fantastic amenities included with your venue rental. Check out our wedding packages for a full listing. 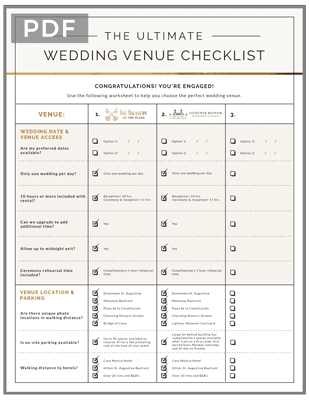 We have also created a handy Wedding Venue Comparison Checklist that you can use during your venue search. 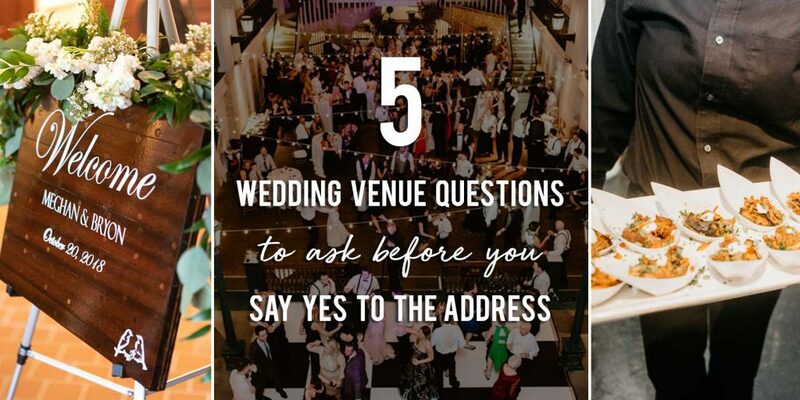 There you have it; the top five essential wedding venue questions to ask before you say “yes to the address.” While there are so many things to consider when choosing a venue, remember that your vendors are here to help you. Ask plenty of questions, take a deep breath, and have fun. Remember, you’ve already made the most important decision of all–you’ve found the person you are choosing to spend your life with! 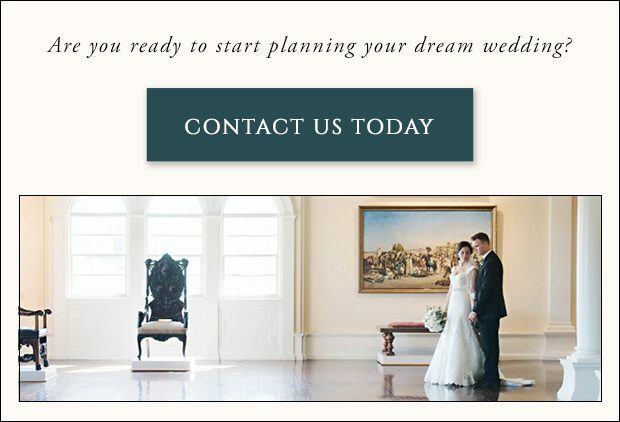 Are you just getting started with planning your dream wedding here in St. Augustine? Our wedding venue specialists are here to help you answer any questions and schedule a tour!